Conopholis alpina var. mexicana is yellowish-white with brown highlights and cream colored flowers. 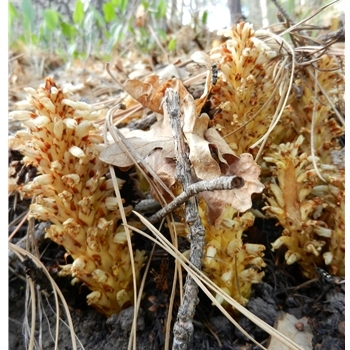 This parasitic plant (lives off the nutrients it gets from the roots of woody plants - has no chlorophyl) grows as a clump of several stems usually under Ponderosa Pine, and is usually no taller than 8 inches.